Description: At dawn June 9, the Union cavalry corps under Maj. Gen. Alfred Pleasonton launched a surprise attack on Stuart’s cavalry at Brandy Station. After an all-day fight in which fortunes changed repeatedly, the Federals retired without discovering Lee’s infantry camped near Culpeper. This battle marked the apogee of the Confederate cavalry in the East. From this point in the war, the Federal cavalry gained strength and confidence. 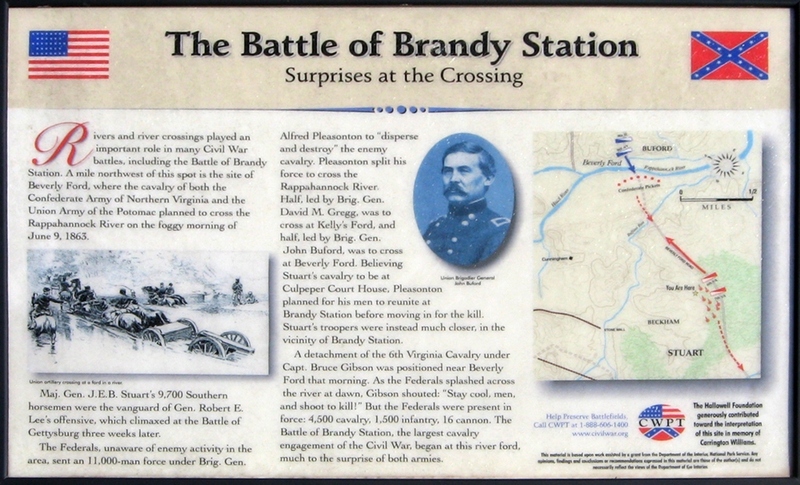 Battle of Brandy Station was the largest cavalry battle of the war and the opening engagement of the Gettysburg Campaign. The duel was also the largest cavalry engagement ever conducted on American soil. The Civil War was known by more than twenty-five names. The most unusual include: The Brothers War; The War to Suppress Yankee Arrogance; The War for the Union; and The War of the Rebellion. Abraham Lincoln had smallpox when he gave the Gettysburg Address and several members of his wife's family were soldiers in the Confederate Army. Also, President Lincoln admitted that one of his favorite tunes was "Dixie." General Nathan Bedford Forrest, CSA, had twenty-nine horses shot from beneath him during the war. Belle Boyd started her career as a spy for the South when, at the age of seventeen, she killed a Federal soldier. After the war, about 3,000 former Confederate officers left the South and moved to foreign countries. Just one of the accounts which I loved… It tells of when Sam and Keith Blalock joined the Twenty-sixth North Carolina Regiment, they claimed to be old friends who were distantly related. It was months before anyone discovered "Sam's" real name was Melinda. When Keith signed up to fight the Yankees, his wife put on a man's attire and went with him to war. I found this book (research) to be the most interesting and fascinating read. A Reader's Review: "I have three of Garrison's books: The Amazing Civil War, Civil War Curiosities, and More Civil War Curiosities. I would recommend each and every book to anyone! The facts that Garrison writes about are both interesting and captivating and being a high school American History teacher, I plan on using the facts that I have found no where else to captivate my students and give them a perspective on the war that they may have never found otherwise." Questions are presented in categories that make it easy to test your knowledge. Also included are interesting sidebar articles, lists of little-known facts, anecdotes, and over 50 unusual black-and-white photographs. With a thorough index, 2,000 Questions and Answers about the Civil War, it provides a valuable resource for students, researchers, and Civil War buffs.